The Dallas Total Home & Gift Market starts today. Pick up your free copy of Dallas Market Center’s Source for the latest trends, retailer profiles, insider insights and more. I’m thankful for the opportunity to demonstrate the potential of Celebrated Living and so pleased with the results of my collaboration with Sr. Art Director Brian Smith and Editor in Chief Anna Fialho Byers. Daphne Vermeulen, Chicas Photo Productions and this year’s Road Warriors — Becca, David, Ashley, Malcolm and Tim — enthusiastically rose to the challenge of an ambitious photoshoot. It was a fantastic collaboration. Three Halloween revelers come upon a scary Victorian mansion, cautiously approach the front door and find themselves in the midst of a fancy masquerade ball. Their horrifying predicament is ultimately mundane and relatable — they're underdressed at a chic party. I defined the narrative and aviator character and asked Red Nose Studio to develop additional characters and bring it all to life. I’m thrilled with the results. Team Robert Dahey delivered a tour de force performance at this year’s Road Warrior photoshoot, and this year’s Road Warriors — Flory, Ruban, Gillian, Jerry and Nish — responded in kind. My “Warriors on the Move” concept was taken in stride by all. 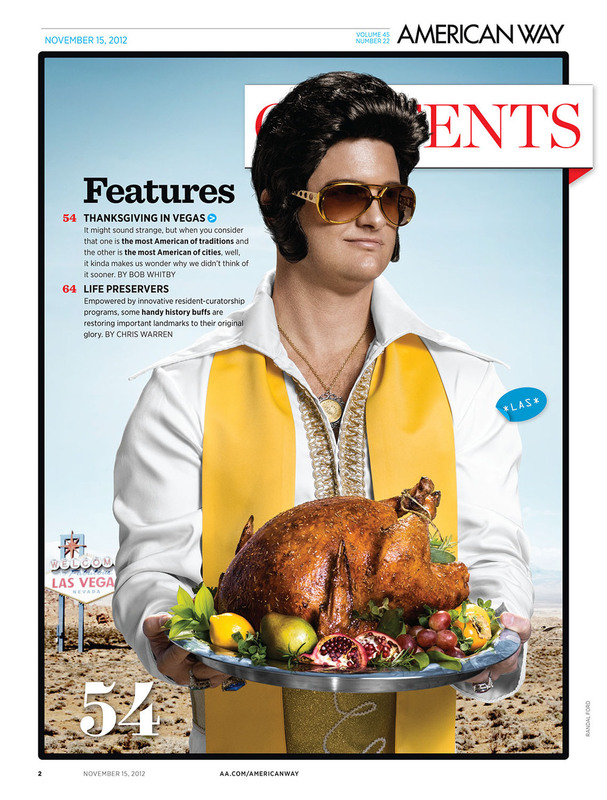 Team Randal Ford executed my “Thanksgiving in Vegas” concept with panache. The turkey is gorgeous. And that bird ain’t too shabby, either. Photography by Randal Ford with assistants Austin Lochheed and Emily McCartney; Food Styling by Stephanie Greenwood; Hair & Makeup by Randi Rogers; Wardrobe by Sally Schnitzius; Retouching by Gigantic Squid; G.P. “The Riot” Theriot IV is Elvis. To prepare a large cast of busy VIPs for a long photo session, I asked them to consider the historical significance of their group portrait. See the Dallas Arts District “family portrait” and read my address to the cast.